Sometimes music just happens. A warm late summer night in 2004 at the Helsinki festival was one of those occasions. Lepistö & Lehti, two master musicians from Finland, debuted on the main stage of the event and the 1000+ audience listened in awe… There’s something surprising about the composition of this ensemble. 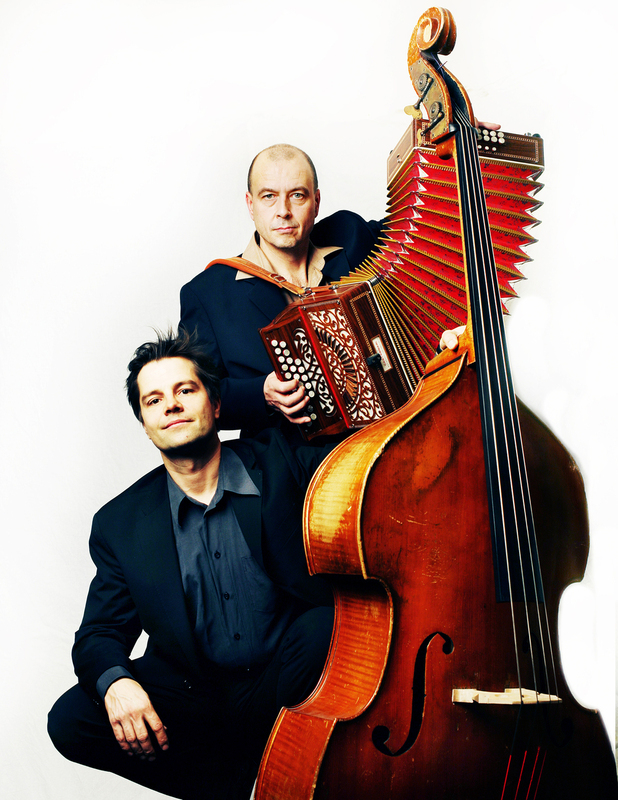 Double bass and accordion, it seems, is not the most obvious of combinations. Yet Markku Lepistö and Pekka Lehti pull it off somehow. How do they do it? Dynamics, a personal connection, and the serendipitous juxtaposition of two worlds are the key to understanding Lepistö & Lehti. Pekka and Markku, hailing from different parts of Finland (city and countryside), joined forces in the band Värttinä in Helsinki wherein they shared more hotel rooms than they can remember. They ended up sharing the stage as a duo, and eventually went on record. The main ingredients in their captivating music are their deep musical connection, their mutual professional respect, and a combined vision where one plus one is more than two. Presenting material selected from both of the artists’ individual repertoire, Lepistö & Lehti aim for these elusive elements; ones that make a casual concert goer stop for a while and listen while these two apply their delicate touches on a large scale sonic canvas. Just listen. Music is best when it just happens.